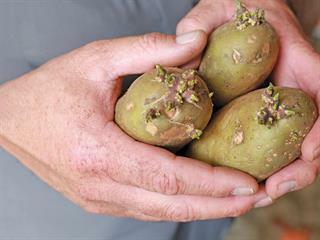 CEO of Agrivan Farming in North West, Werner du Plessis, spoke to Gerhard Uys about farming seed potatoes and how his business has remained at the top of its game for over 25 years. A mini tuber takes between four and five years to reach marketable stage. Farming potatoes is in itself a specialised field, while growing seed potatoes is an even more specialised field within it. Agrivan Farming, situated near Christiana in North West, has 28 years’ experience in seed potato farming and has ensured the quality of its product by taking full control of the value chain. In partnership with WesGrow Potatoes, Agrivan manages every step – from propagation material to supplying clients with certified commercial seed – and this has set it apart from producers outsourcing certain legs of the process. Considering that it takes four to five years for a mini-tuber to reach the stage where it can be sold to a potato grower, controlling the value chain in this way is a long-term commitment. Agrivan cultivars are comprised of 50% Mondial, 37% Sifra and 4% Innovator, while the other 9% to 10% is used for the development of new cultivars.Panamera, Electra and Savannah are promising future prospects. “The current market share held by WesGrow and the constant change in market demands [are the key factors] in choosing the varieties that we grow,” Werner explains. When developing a new cultivar, it is important to understand the market and its needs, he stresses. In addition, adaptability in terms of climatic and other growing conditions in different regions is a major factor. Exporting to countries in the Southern African Development Community means understanding a foreign market. 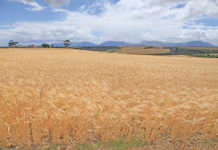 WesGrow and their shareholders and growers all follow one common strategy regarding the production of seed potatoes and voluntarily subscribe to certain values that take the business forward.For example, Agrivan has an eight-year crop rotation system and only plants eragrostis and oats in this system. Werner explains that WesGrow did not enforce the system, but he and his team regard it as a sustainable practice. The total annual Agrivan potato planting is registered under the national certification scheme and only certified seed is planted. 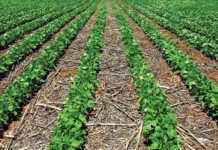 About 25% of the total harvest is marketed and used as certified seed, with 75% marketed as table potatoes. “The whole harvest is suitable for seed, and size is the only determinant between seed and table potatoes,” Werner explains. Potatoes of 100g and smaller are marketed as seed, while anything above is for the table market. The seed market is supplied with 25kg pockets. The number of tubers per pocket ranges from 250 to 600, and clients normally get what they prefer. Table potatoes are sold to various markets in 7kg and 10kg pockets. Depending on climate region and grower type, plant densities vary from 25 000 tubers/ha to 70 000 tubers/ha, with a national average of around 160 bags of seed per hectare. He explains that growing seed potatoes is a perfect triangular relationship between good yield, enough tuber units per plant and minimal virus infection. According to Werner, a seed grower’s biggest risk is a lack of control of volunteer plants on the previous year’s post-harvest plantings. These plants increase the risk of virus infection on the current planting. This risk is eliminated by good post-harvest control methods – both chemical and mechanical – and active, sustainable management thereof. Potato Leaf Roll Virus (PLRV) and Potato Virus Y are the most common and influential viruses threatening seed growers in SA. They are carried by aphids and the longer the growth period, the larger the risk of infection. 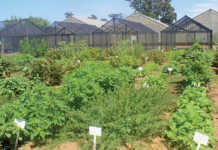 The physiological status of the potato plant determines the risk of infection, with the latter part of the growth period being the most risky. Good chemical control throughout the season, a well-trained and committed volunteer plant team, as well as a shortened growth period, lowers this risk. “WesGrow differentiates from competitors’ due to the fact that we maintain lower tolerance levels than the national standard: PLRV at only 2,5% instead of 5%, as the national certification scheme indicates. “The core principle of growing potato seed is planting top-quality seed, that’s why we remain in control of the whole multiplication process. “We aim to use only the best products and methods, ensuring that our yield and quality remain at the highest level. However, there’s a balance between benchmarking input cost and diminishing returns, and we constantly strive to stay on the line,” says Werner, explaining that he and his team are output- rather than input-driven. Despite the sometimes frightening realities facing the country’s farmers, Agrivan remains positive and reinvests a substantial part of its profits back into the business. According to Werner, farmer numbers are decreasing and farming units are becoming bigger, and thus the need for competent management is increasing. Permanent staff receive bonuses based on production figures and profit. Sharing prosperity with the workforce results in earning workers’ trust and inspiring them to take ownership of their work, Werner explains. Phone Werner du Plessis on 082 456 5744 or email him at [email protected].